Ivory Coast () or Côte d'Ivoire (; ; French: ( )), officially the Republic of Côte d'Ivoire (French: République de Côte d'Ivoire), is a country in West Africa. Ivory Coast's de jure capital is Yamoussoukro and the biggest city is the port city of Abidjan. Prior to its colonization by Europeans, Ivory Coast was home to several states, including Gyaaman, the Kong Empire, and Baoulé. 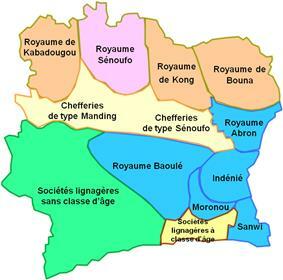 There were two Anyi kingdoms, Indénié and Sanwi, which attempted to retain their separate identity through the French colonial period and after independence. Ivory Coast became a protectorate of France in 1843–44 and in 1893 it became a French colony as part of the European scramble for Africa. Ivory Coast became independent in 1960. From 1960 to 1993, the country was led by Félix Houphouët-Boigny. It maintained close political and economic association with its West African neighbours, while at the same time maintaining close ties to the West, especially France. Since the end of Houphouët-Boigny's rule in 1993, Ivory Coast has experienced one coup d’état, in 1999, and two religiously grounded civil wars. 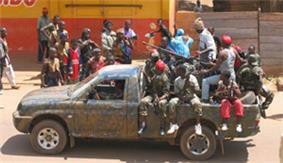 The first civil war was between 2002 and 2007,  and the Second Ivorian Civil War being in 2010-2011. Portuguese and French merchant-explorers in the 15th and 16th centuries divided the west coast of Africa, very roughly, into five coasts reflecting local economies. The coast that the French named the Côte d'Ivoire and the Portuguese named the Costa do Marfim—both, literally, being "Ivory Coast"—lay between what was known as the Guiné de Cabo Verde, so-called "Upper Guinea" at Cabo Verde, and Lower Guinea. There were also a "Grain Coast", a "Gold Coast", and a "Slave Coast", and, like those three, the name "Ivory Coast" reflected the major trade that occurred on that particular stretch of the coast: the export of ivory. Other names for the coast of ivory included the Côte de Dents,[n 1] literally "Teeth Coast", again reflecting the trade in ivory; the Côte de Quaqua, after the people that the Dutch named the Quaqua (alternatively Kwa Kwa); the Coast of the Five and Six Stripes, after a type of cotton fabric also traded there; and the Côte du Vent[n 2], the Windward Coast, after perennial local off-shore weather conditions. One can find the name Cote de(s) Dents regularly used in older works. It was used in Duckett's Dictionnaire (Duckett 1853) and by Nicolas Villault de Bellefond, for examples, although Antoine François Prévost used Côte d'Ivoire. In the 19th century it died out in favour of Côte d'Ivoire. The coastline of the modern state is not quite coterminous with what the 15th- and 16th-century merchants knew as the "Teeth" or "Ivory" coast, which was considered to stretch from Cape Palmas to Cape Three Points and which is thus now divided between the modern states of Ghana and Ivory Coast (with a minute portion of Liberia). But it retained the name through French rule and independence in 1960. The name had long since been translated literally into other languages,[n 3] which the post-independence government considered to be increasingly troublesome whenever its international dealings extended beyond the Francophone sphere. Therefore, in April 1986, the government declared Côte d'Ivoire (or, more fully, République de Côte d'Ivoire) to be its formal name for the purposes of diplomatic protocol, and officially refuses to recognize or accept any translation from French to another language in its international dealings. Prehistoric polished stone celt from Boundiali in northern Ivory Coast. Photo taken at the IFAN Museum of African Arts in Dakar, Senegal. Its slow decline starting at the end of the 14th century followed internal discord and revolts by vassal states, one of which, Songhai, flourished as an empire between the fourteenth and sixteenth centuries. Songhai was also weakened by internal discord, which led to factional warfare. This discord spurred most of the migrations of peoples southward toward the forest belt. The dense rain forest, covering the southern half of the country, created barriers to the large-scale political organizations that had arisen in the north. Inhabitants lived in villages or clusters of villages; their contacts with the outside world were filtered through long-distance traders. Villagers subsisted on agriculture and hunting. The Abron kingdom of Gyaaman was established in the 17th century by an Akan group, the Abron, who had fled the developing Ashanti confederation of Asanteman in what is present-day Ghana. From their settlement south of Bondoukou, the Abron gradually extended their hegemony over the Dyula people in Bondoukou, who were recent émigrés from the market city of Begho. Bondoukou developed into a major centre of commerce and Islam. 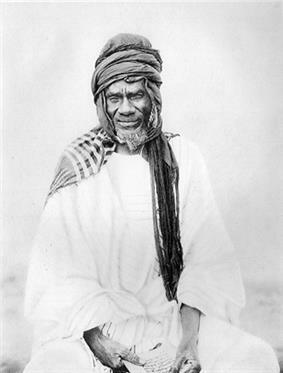 The kingdom's Quranic scholars attracted students from all parts of West Africa. In the mid-17th century in east-central Ivory Coast, other Akan groups' fleeing the Asante established a Baoulé kingdom at Sakasso and two Agni kingdoms, Indénié and Sanwi. Compared to neighbouring Ghana, Ivory Coast suffered little from the slave trade, as European slaving and merchant ships preferred other areas along the coast with better harbours. The earliest recorded European voyage to West Africa was made by the Portuguese and took place in 1482. The first West African French settlement, Saint Louis, was founded in the mid-17th century in Senegal while, at about the same time, the Dutch ceded to the French a settlement at Goree Island, off Dakar. 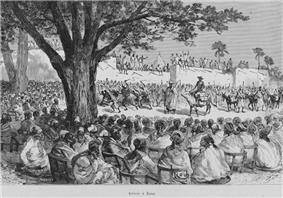 A French mission was established in 1637 Assinie near the border with the Gold Coast (now Ghana). Assinie's survival was precarious, however it was not until the mid-19th century that the French were firmly established in Ivory Coast. In 1843–4, French admiral Bouët-Willaumez signed treaties with the kings of the Grand Bassam and Assinie regions, making their territories a French protectorate. French explorers, missionaries, trading companies, and soldiers gradually extended the area under French control inland from the lagoon region. Pacification was not accomplished until 1915. Activity along the coast stimulated European interest in the interior, especially along the two great rivers, the Senegal and the Niger. Concerted French exploration of West Africa began in the mid-19th century but moved slowly, based more on individual initiative than on government policy. In the 1840s, the French concluded a series of treaties with local West African rulers that enabled the French to build fortified posts along the Gulf of Guinea to serve as permanent trading centres. 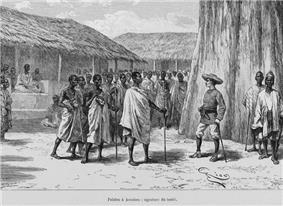 Louis-Gustave Binger of French West Africa in 1892 treaty signing with Famienkro leaders, in present-day N'zi-Comoé Region, Ivory Coast. France's imposition of a head tax in 1900 to support the colony in a public works program, provoked a number of revolts. Ivoirians viewed the tax as a violation of the terms of the protectorate treaties, because they thought that France was demanding the equivalent of a coutume from the local kings, rather than the reverse. Much of the population, especially in the interior, considered the tax a humiliating symbol of submission. In 1905, the French officially abolished slavery in most of French West Africa. From 1904 to 1958, Ivory Coast was a constituent unit of the Federation of French West Africa. It was a colony and an overseas territory under the Third Republic. In World War I Ivory Coast was put into a bad position with the German invasion threatened in 1914. But after France made regiments from Ivory Coast to fight in France. Coloney resources were rationed from 1917-1919. Some 150,000 men from Ivory Coast died in World War I. Until the period following World War II, governmental affairs in French West Africa were administered from Paris. France's policy in West Africa was reflected mainly in its philosophy of "association", meaning that all Africans in Ivory Coast were officially French "subjects", but without rights to representation in Africa or France. In World War II, the Vichy regime remained in control until 1942,when British troops invaded with out much resistance. Winston Churchill gave the power back to members of General Charles de Gaulle's provisional government. By 1943 the Allies had returned French West Africa back to the French. The Brazzaville Conference of 1944, the first Constituent Assembly of the Fourth Republic in 1946, and France's gratitude for African loyalty during World War II led to far-reaching governmental reforms in 1946. French citizenship was granted to all African "subjects," the right to organize politically was recognized, and various forms of forced labour were abolished. Houphouët-Boigny's one-party rule was not amenable to political competition. Laurent Gbagbo, who would be the president of Ivory Coast in 2000, had to flee as he incurred the ire of Houphouët-Boigny when Gbagbo founded the Front Populaire Ivoirien. Houphouët-Boigny banked on his broad appeal to the population who continually elected him. He was also criticized for his emphasis on developing large scale projects. Many felt the millions of dollars spent transforming his home village, Yamoussoukro, into the new capital that it became, were wasted; others supported his vision to develop a centre for peace, education and religion in the heart of the country. But in the early 1980s, the world recession and a local drought sent shock waves through the Ivoirian economy. Due to the overcutting of timber and collapsing sugar prices, the country's external debt increased threefold. 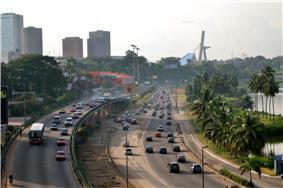 Crime rose dramatically in Abidjan. Unlike Houphouët-Boigny, who was very careful in avoiding any ethnic conflict and left access to administrative positions open to immigrants from neighbouring countries, Bedié emphasized the concept of "Ivority" (Ivoirité) to exclude his rival Alassane Ouattara, who had two northern Ivorian parents, from running for future presidential election. As people originating from foreign countries are a large part of the Ivoirian population, this policy excluded many people from Ivoirian nationality, and the relationship between various ethnic groups became strained which resulted in two civil wars in the following decades. 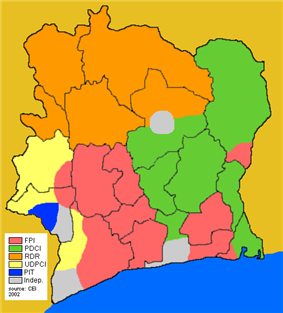 A technical in the First Ivorian Civil War, 2002–2007. In the early hours of 19 September 2002, while the President was in Italy, there was an armed uprising. Troops who were to be demobilised mutinied, launching attacks in several cities. The battle for the main gendarmerie barracks in Abidjan lasted until mid-morning, but by lunchtime the government forces had secured the main city, Abidjan. They had lost control of the north of the country, and the rebel forces made their stronghold in the northern city of Bouake. The rebels threatened to move on Abidjan again and France deployed troops from its base in the country to stop any rebel advance. The French said they were protecting their own citizens from danger, but their deployment also aided the government forces. It was not established as a fact that the French were helping either side but each side accused them of being on the opposite side. It is disputed as to whether the French actions improved or worsened the situation in the long term. What exactly happened that night is disputed. The government claimed that former president Robert Guéï had led a coup attempt, and state TV showed pictures of his dead body in the street; counter-claims stated that he and fifteen others had been murdered at his home and his body had been moved to the streets to incriminate him. 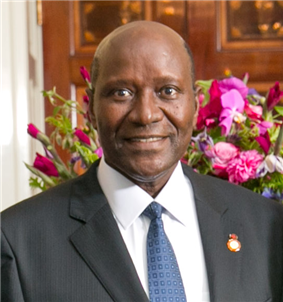 Alassane Ouattara took refuge in the German embassy; his home had burned down. Armed Ivorians next to a French Foreign Legion tank, 2004. The presidential elections that should have been organized in 2005 were postponed until November 2010. The preliminary results announced independently by the president of the Electoral Commission from the headquarter of Allasane due to controverses about fraud in that commission, constisting in majority and presided by Allasane supporters showed a loss for Gbagbo in favour of his rival, former prime minister Alassane Ouattara. The ruling FPI contested the results before the Constitutional Council, charging massive fraud in the northern departments controlled by the rebels of the Forces Nouvelles de Côte d'Ivoire (FNCI). These charges were contradicted by United Nations' observers (differently from Africa union Observers). The report of the results led to severe tension and violent incidents. The Constitutional Council, which consists of Gbagbo supporters, declared the results of seven northern departments unlawful and that Gbagbo had won the elections with 51% of the vote - instead of Ouattara winning with 54%, as reported by the Electoral Commission. After the inauguration of Gbagbo, Ouattara, recognized as the winner by most countries and the United Nations, organized an alternative inauguration. These events raised fears of a resurgence of the civil war; thousands of refugees have fled the country. The African Union sent Thabo Mbeki, former President of South Africa, to mediate the conflict. The United Nations Security Council adopted a common resolution recognising Alassane Ouattara as winner of the elections, based on the position of the Economic Community of West African States (ECOWAS). ECOWAS suspended Ivory Coast from all its decision-making bodies while the African Union also suspended the country's membership. 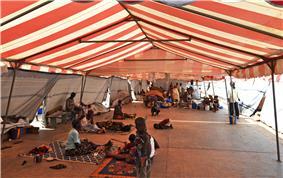 A shelter for internally displaced persons during the 2011 civil war. The 2010 presidential election led to the Duékoué, hundreds of people were killed. In nearby Bloléquin, dozens were killed. UN and French forces took military action against Gbagbo. Gbagbo was taken into custody after a raid into his residence on 11 April. The country was severely damaged by the war, and observers consider that it will be a challenge for Ouattara to rebuild the economy and reunite Ivorians. Ivory Coast is administratively reorganised into twelve districts with two district-level autonomous cites. The districts were further divided into regions, departments and sub-prefectures. Under this new schema there were thirty-one regions. Since 1983, Ivory Coast's capital has been Yamoussoukro. Abidjan is the administrative center. Most countries maintain their embassies in Abidjan. The Ivoirian population continues to suffer because of an ongoing civil war. International human rights organizations have noted problems with the treatment of captive non-combatants by both sides and the re-emergence of child slavery among workers in cocoa production. On 2 December, the Electoral Commission declared that Ouattara had won the election by a margin of 54% to 46%. In response, the Gbagbo-aligned Constitutional Council rejected the declaration, and the government announced that country's borders had been sealed. An Ivorian military spokesman said, "The air, land and sea border of the country are closed to all movement of people and goods." Ivory Coast is a member of the African Union, La Francophonie, Latin Union, Economic Community of West African States and South Atlantic Peace and Cooperation Zone. As of 2012, major equipment items reported by the Ivory Coast Army included ten T-55 tanks (marked as potentially unserviceable), 5 AMX-13 light tanks, 34 reconnaissance vehicles, 10 BMP-1/2 armoured infantry fighting vehicles, 41 wheeled APCs, and 36+ artillery pieces. In 2012 the Ivory Coast Airforce consisted of one Mil Mi-24 attack helicopter and three SA330L Puma transports (marked as potentially unserviceable). 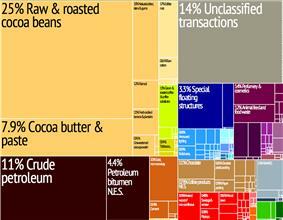 A proportional representation of Ivory Coast's exports. Ivory Coast has, for the region, a relatively high income per capita (USD 1014.4 in 2013 ) and plays a key role in transit trade for neighboring, landlocked countries. The country is the largest economy in the West African Economic and Monetary Union, constituting 40 percent of the monetary union’s total GDP. The country is the world's largest exporter of Cocoa beans, and the fourth largest exporter of goods, in general, in sub-Saharan Africa (following South Africa, Nigeria and Angola). In 2009, the cocoa bean farmers earned $2.53 billion for cocoa exports and is expected to produce 630,000 metric tons in 2013. According to The Hershey Company, the price of cocoa beans are expected to rise dramatically in upcoming years. The Ivory Coast also has 100,000 rubber farmers which earned a total of $105 million in 2012. Abidjan with an estimated population of 4.6 million in 2014 is the Ivory Coast's largest settlement and the economic capital of the Ivory Coast. According to 2012 government survey, the fertility rate was 5.0, with 3.7 in urban areas and 6.3 in rural areas. French, the official language, is taught in schools and serves as a lingua franca in the country. An estimated 65 languages are spoken in Ivory Coast. One of the most common is Dyula, which acts as a trade language as well as a language commonly spoken by the Muslim population. Ethnic groups include Akan 42.1%, Voltaiques or Gur 17.6%, Northern Mandes 16.5%, Krous 11%, Southern Mandes 10%, other 2.8% (includes 30,000 Lebanese and 45,000 French; 2004). 77% of the population are considered Ivoirians. Since Ivory Coast has established itself as one of the most successful West African nations, about 20% of the population (about 3.4 million) consists of workers from neighbouring Liberia, Burkina Faso and Guinea. The native born population is roughly split into three groups of Muslim, Christian (primarily Roman Catholic) and animist. Religion in Ivory Coast remains very heterogeneous, with Islam (almost all Sunni Muslims, with some Ahmadi Muslims) and Christianity (mostly Roman Catholic with smaller numbers of Methodists and Protestants) being the major religions. Muslims dominate the north, while Christians dominate the south. In 2009, according to U.S. Department of State estimates, Christians and Muslims each made up 35 to 40% of the population, while an estimated 25% of the population practiced traditional religions. Life expectancy at birth was 41 for males in 2004; for females it was 47. Infant mortality was 118 of 1000 live births. There are 12 physicians per 100,000 people. About a quarter of the population lives below the international poverty line of US$1.25 a day. About 36% of women have undergone female genital mutilation. According to 2010 estimates, Ivory Coast has the 27th highest maternal mortality rate in the world. The HIV/AIDS rate was estimated in 2012 at 3.20% among adults aged 15–49 years. The University campus of the Université de Cocody. Popular music genres from Ivory Coast include zoblazo, zouglou and Coupé-Décalé. A few Ivorian artists who have known international success are Magic Système, Alpha Blondy, Meiway, Dobet Gnahore, Tiken Dja Fakoly, Christina Goh from Ivorian descent. The country has been host for several major African sporting events, with the most recent being the 2013 African Basketball Championship. In the past, the country further hosted the 1984 Africa Cup of Nations, in which its football team finished 5th, and the 1985 African Basketball Championship, where its basketball team won the gold medal. 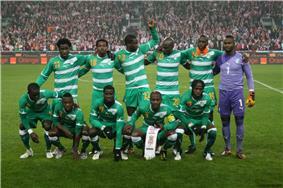 The most popular sport in Ivory Coast is association football. The national football team has played in the World Cup three times, in Germany 2006, in South Africa 2010 and in Brazil in 2014. Rugby union is also popular, and the national rugby union team qualified to play at the Rugby World Cup in South Africa in 1995. The traditional cuisine of Ivory Coast is very similar to that of neighboring countries in west Africa in its reliance on grains and tubers. Cassava and plantains are significant parts of Ivorian cuisine. A type of corn paste called "Aitiu" is used to prepare corn balls, and peanuts are widely used in many dishes. Attiéké is a popular side dish in Ivory Coast made with grated cassava and is a vegetable-based couscous. A common street-vended food is aloko, which is ripe banana fried in palm oil, spiced with steamed onions and chili and eaten alone or with grilled fish. Chicken is commonly consumed, and has a unique flavor due to its lean, low-fat mass in this region. Seafood includes tuna, sardines, shrimp and bonito, which are similar to tuna. Mafé is a common dish consisting of meat in a peanut sauce. ^ The BBC usually uses "Ivory Coast" both in news reports and on its page about the country. The Guardian newspaper's style guide says: "Ivory Coast, not 'The Ivory Coast' or 'Côte d'Ivoire'; its nationals are Ivorians." ABC News, FOX News, The Times, The New York Times, the South African Broadcasting Corporation, and the Canadian Broadcasting Corporation all use "Ivory Coast" either exclusively or predominantly..
^ Many governments use "Côte d'Ivoire" for diplomatic reasons, as do their outlets, such as the Chinese CCTV News. Other organizations that use "Côte d'Ivoire" include FIFA and the IOC (referring to their national football and Olympic teams in international games and in official broadcasts), and The Economist newsmagazine. Encyclopædia Britannica, and National Geographic Society. both use Cote d'Ivoire. ^ a b c d e "The World Factbook". ^ a b "Republic of Côte d'Ivoire National Statistical Institute". ins.ci. 1 October 2014. ^ a b "Côte d'Ivoire". International Monetary Fund. Retrieved 1 October 2014. ^ "Cote d'Ivoire definition". Dictionary.com. Retrieved 23 May 2014. ^ "Pre-European Period". Library of Congress Country Studies. ^ "Loi n° 2000-513 du 1er août 2000 portant Constitution de la République de Côte d’Ivoire". Journal Officiel de la République de Côte d’Ivoire (in Français) 42 (30): 529–538. 3 August 2000. Archived from the original on 25 March 2009. Retrieved 7 August 2008. ^ "Country profile: Ivory Coast". BBC News. 24 February 2010. Retrieved 30 April 2010. ^ "Guardian Style Guide: I". ^ "Cote d'Ivoire – Encyclopedia – Britannica Online Encyclopedia". Britannica.com. Retrieved 20 June 2010. ^ "Places Directory". nationalgeographic.com. 25 June 2008. Retrieved 20 June 2010. ^ Guédé, François Yiodé (1995). "Contribution à l'étude du paléolithique de la Côte d'Ivoire : État des connaissances". Journal des Africanistes 65 (2). pp. 79–91. ^ a b "Ivory Coast – Arrival of the Europeans". Library of Congress Country Studies. Library of Congress. November 1988. Retrieved 11 April 2009. ^ "Library of Congress Country Studies". Library of Congress. November 1988. Retrieved 11 April 2009. ^ "Ivory Coast – FRENCH RULE UNTIL WORLD WAR II: Evolution of Colonial Policy". Library of Congress Country Studies. Library of Congress. November 1988. Retrieved 11 April 2009. ^ "Ivory Coast – Colonial Administration". Library of Congress Country Studies. Library of Congress. November 1988. Retrieved 11 April 2009. ^ "Ivory Coast – Repression and Conquest". Library of Congress Country Studies. Library of Congress. November 1988. Retrieved 11 April 2009. ^ Holguin, Jaime (15 November 2004) "France's 'Little Iraq'" at the Wayback Machine (archived October 8, 2013). CBS News. ^ "BBC News – Thousands flee Ivory Coast for Liberia amid poll crisis". 26 December 2010. Retrieved 26 December 2010. ^ "FINAL COMMUNIQUE ON THE EXTRAORDINARY SESSION OF THE AUTHORITY OF HEADS OF STATE AND GOVERNMENT ON COTE D’IVOIRE", ECOWAS, 7 December 2010. ^ "COMMUNIQUE OF THE 252ND MEETING OF THE PEACE AND SECURITY COUNCIL", African Union, 9 December 2010. ^ FBI nabbed colonel on official business. UPI, 21 September 2010. ^ Colum Lynch; William Branigin (11 April 2011). "Ivory Coast strongman arrested after French forces intervene". Washington Post. Retrieved 12 April 2011. ^ Thalia Griffiths (11 April 2011). 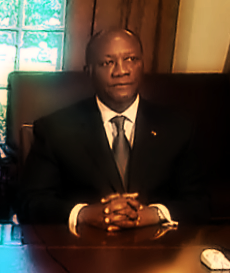 "The war is over – but Ouattara's struggle has barely begun". London: The Guardian. ^ Agnero, Eric (10 November 2010). "Ivory Coast postpones presidential runoff vote". CNN. Retrieved 11 November 2010. 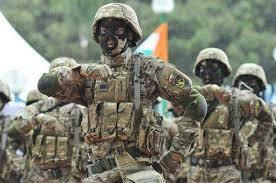 ^ "Ivory Coast election: Army says it has sealed borders". BBC. 3 December 2010. Retrieved 3 November 2010. ^ "Ivory Coast Makes 1st Cocoa Export Since January". Associated Press via NPR. 9 May 2011. Retrieved 21 January 2014. ^ Monnier, Olivier (27 March 2013). "Ivory Coast San Pedro Port Sees Cocoa Exports Stagnating". Bloomberg. Retrieved 21 January 2014. ^ Tuttle, Brad (23 September 2013), "Time to Get Ready for a Smaller Hershey Bar?" Business.time.com. Retrieved on 20 April 2014. ^ "Ivory Coast reaps more rubber as farmers shift from cocoa". Reuters. 13 February 2013. Retrieved 21 January 2014. ^ "Cote d'Ivoire | Office of the United States Trade Representative". Ustr.gov. 29 March 2009. Retrieved 21 January 2014. ^ "Premiers résultats définitifs du RGPH-98 (Recensement Général de la Population et de l’Habitation de 1998)" (in Français). Abidjan: Institut National de la Statistique, Bureau Technique Permanent du Recensement. 2002. 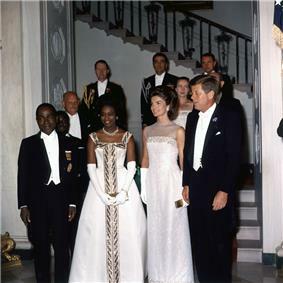 ^ Ivory Coast – Population, U.S. Library of Congress. ^ "Ivory Coast – The Economy". Countrystudies.us. Retrieved 20 June 2010. ^ "Ivory Coast – The Levantine Community". Countrystudies.us. Retrieved 20 June 2010. ^ "Rwanda Syndrome on the Ivory Coast"
^ Marie Miran. Islam, histoire et modernité en Côte d'Ivoire. p. 352. ^ Cote d'Ivoire. State.gov. 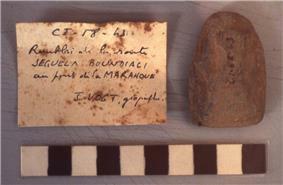 Retrieved on 17 August 2012. ^ a b c "WHO Country Offices in the WHO African Region — WHO | Regional Office for Africa". Afro.who.int. Retrieved 20 June 2010. ^ Human Development Indices, Table 3: Human and income poverty, p. 35. Retrieved on 1 June 2009. ^ "Population, Health, and Human Well-Being-- Côte d'Ivoire" (PDF). EarthTrends. 2003. Archived from the original on 11 May 2011. Retrieved 6 December 2010. ^ a b "Côte d'Ivoire – Secondary Education". Education.stateuniversity.com. Retrieved 20 June 2010. ^ a b c d "Ivory Coast, Côte d'Ivoire: Cuisine and Recipes." Whats4eats.com. Retrieved June 2011. Auzias, Dominique; Labourdette, Jean-Paul (2008). Côte d'Ivoire. Petit futé Country Guides (in French). Petit Futé. Chisholm, Hugh, ed. (1911). "Ivory Coast". David, Philippe (2000). La Côte d'Ivoire (in French) (KARTHALA Editions, 2009 ed.). Paris: Méridiens. Duckett, William (1853). "Côte Des Dents". Dictionnaire de la conversation et de la lecture inventaire raisonné des notions générales les plus indispensables à tous (in French) 6 (2nd ed.). Paris: Michel Lévy frères. Homans, Isaac Smith (1858). "Africa". A cyclopedia of commerce and commercial navigation 1. New York: Harper & brothers. Lea, David; Rowe, Annamarie (2001). "Côte d'Ivoire". A Political Chronology of Africa. Political Chronologies of the World 4. Taylor & Francis. Lipski, John M. (2005). A History of Afro-Hispanic Language: Five Centuries, Five Continents. Cambridge University Press. Thornton, John K. (1996). "The African background to American colonization". In Engerman, Stanley L.; Gallman, Robert E. The Cambridge Economic History of the United States 1. Cambridge University Press. Walckenaer, Charles-Athanase (1827). Histoire générale des voyages ou Nouvelle collection des relations de voyages par mer et par terre (in French) 8. Paris: Lefèvre.